John Lennon sang, “Life is what happens to you while you’re busy making other plans” (Though it turns out there are other attributions. Perhaps others said that before John Lennon). This manifests in so many ways for all of us. We can’t, don’t pay attention to everything. We try to go in some direction, but the set of blessings and curses of our choices are never quite what we bargained for. I’ve been blessed with small bodies of water in the last 15 years. Really odd how that happened. The last place I bought, a fixer-upper that was an 1850’s farm-hand’s house had a few things going for it. One was that I could afford it, and the other was that it was near Post Pond, which was a rich spot to blossom into this stage of my being as a photographer. I knew that Post Pond was nice. I had no idea how much time I would spend there and what an impact it would have on my vision. Then when we decided to buy this house in Vermont, it had a little pond in the backyard. Deep enough to swim in. “Maybe we could ice skate on it.” OK, that’s a nice touch. The house is has nice character and we can afford it. But it turns out that the pond has been one of my favorite things about this place. In deep winter it’s just white, and maybe not so interesting to photograph so much. In the summer, fall, and early winter it’s an ever-changing rich opportunity to photograph. I would never want to be away from a little pond or big pond or a lake as long as I have a camera to my name. The pond is ringed with birch trees for about half the perimeter, and they are lovely in many respects. 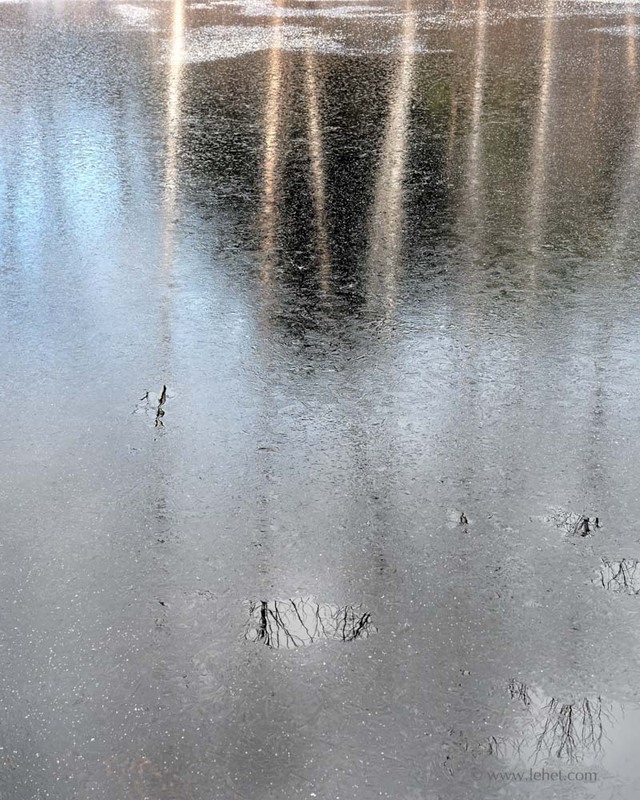 These two images have different days of new ice, and the birch trees reflected on it. In the winter the sunrise is late enough, and of course I’m close, so it’s easy to bundle up and get out there in the first light. The pink on the birches below is the sunrise light. The book is available from Tupelo Press here. as well as on Amazon and other vendors. 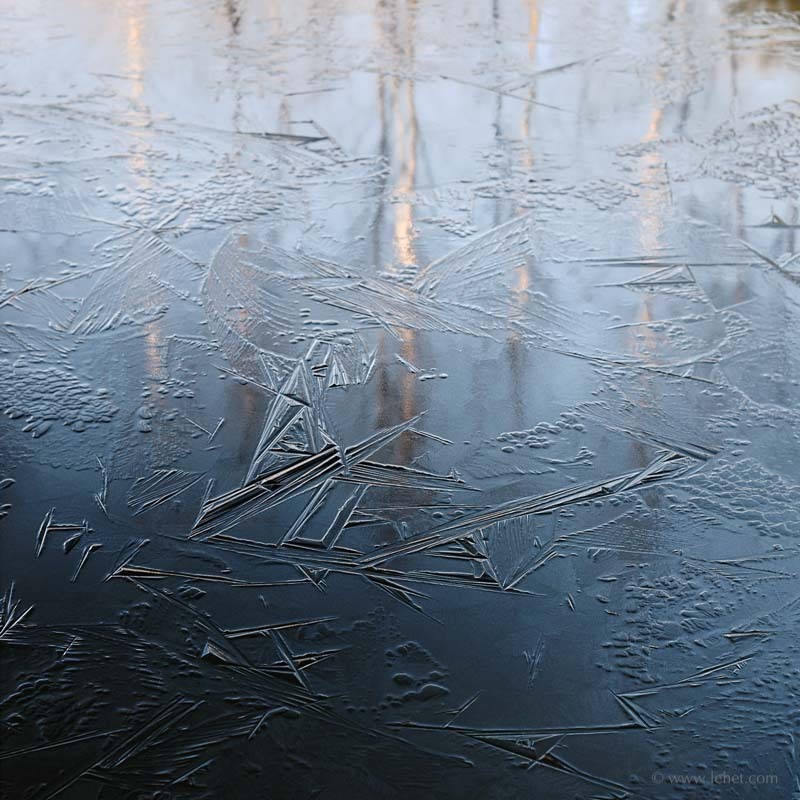 This entry was posted in Abstract, blue, Ice, New England, Vermont, Winter on January 18, 2016 by john lehet.